Halloween is definitely one holiday that has so much party potential! Dressing up and going trick-or-treating is tradition, but kids love getting together to celebrate too! These Halloween games for kids are some of our current favorites! 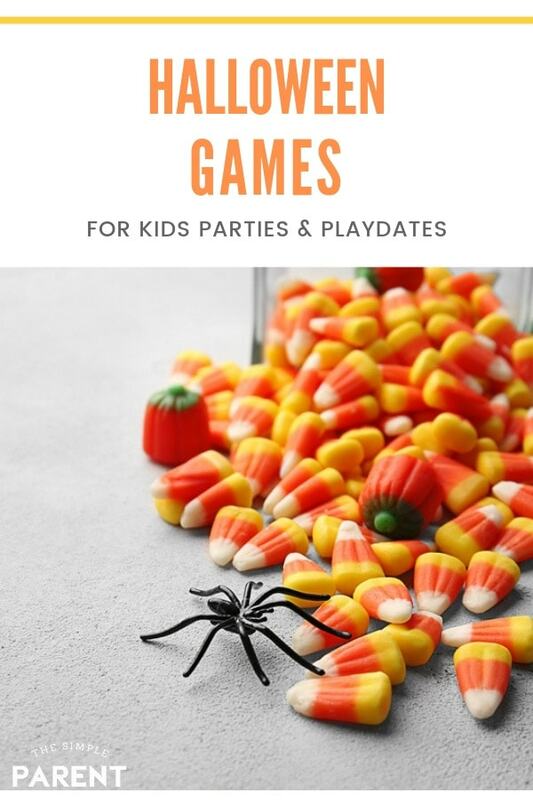 The great thing about these games is that you can use them for a mellow Halloween themed playdate with friends or you can go all out and plan an epic celebration with these Halloween party games for kids! Costume contests and pinatas are tons of fun for October parties, but these kids Halloween party ideas are easy to put together and can really help you up your game! 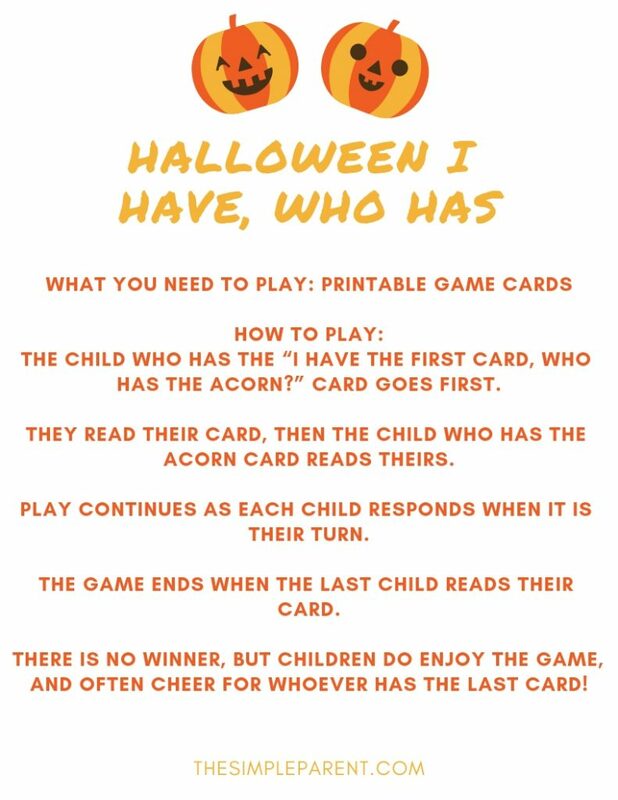 Some of my favorite Halloween games for kids come from my time teaching. This is one of them but kids love playing it whether they’re at home or school! The child who has the “I have the first card, who has the acorn?” card goes first. They read their card, then the child who has the acorn card reads theirs. Play continues as each child responds when it is their turn. The game ends when the last child reads their card. There is no winner, but children do enjoy the game, and often cheer for whoever has the last card! This is a great game for younger groups of kids who might struggle with not winning games. Grade One Snapshot on Teachers Pay Teachers has the fun and affordable set of printable cards for this game! Some Halloween games for kids are best played with a certain number of people. Mummy Wrap works the easiest if the kids can be divided into pairs of two, but it’s also flexible and you can make it work with groups of three if needed. Have one child stand still with their arms out and have the other child slowly and methodically wrap their arms, torso, legs, and head with the toilet paper. It will be hard for them to stand still due to all the giggling. If the toilet paper breaks, just tuck it back in and continue wrapping. Take a picture on your phone and show them. Then have the second child get wrapped. Compare all of the photos to see who is the winner! Or you can play this Halloween game without a winner as well. The kids will be laughing so hard that they’ll all be winners! 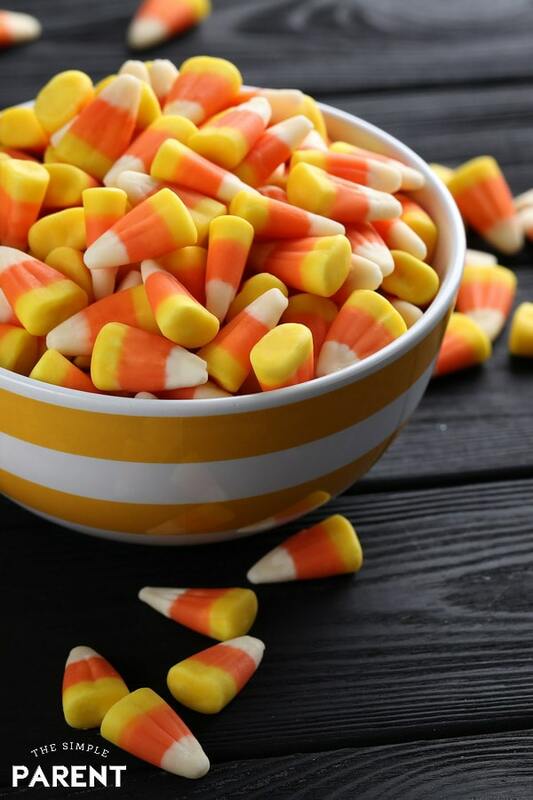 Fill up a clear jar or bowl with candy corn. Have the kids guess how many are in the container. The closest guess wins the candy! 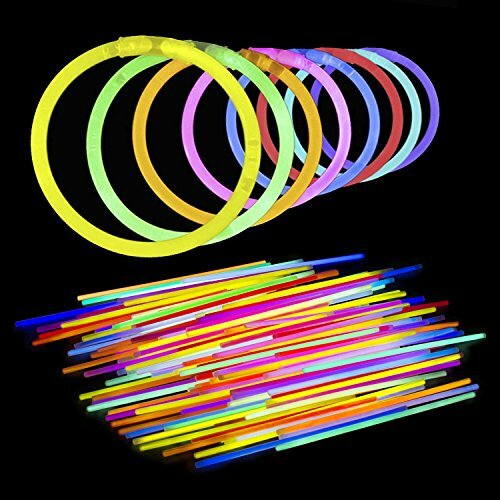 You can use glow-in-the-dark bracelets to make it more challenging for older kids to play! You can also just use pieces of paper and write your own cards. But Buggy and Buddy has some great Halloween Charades Cards that are free to print! Cut out the rectangles with the pictures and words to be guessed and fold them up. Place the folded papers in a container. Take turns drawing a paper from the container and acting it out in front of your audience until they guess it correctly. If your child is not yet reading independently, you may want to go over each picture beforehand to be sure they know what each one is! It’s the easiest way to make sure everyone has fun and no one gets frustrated! 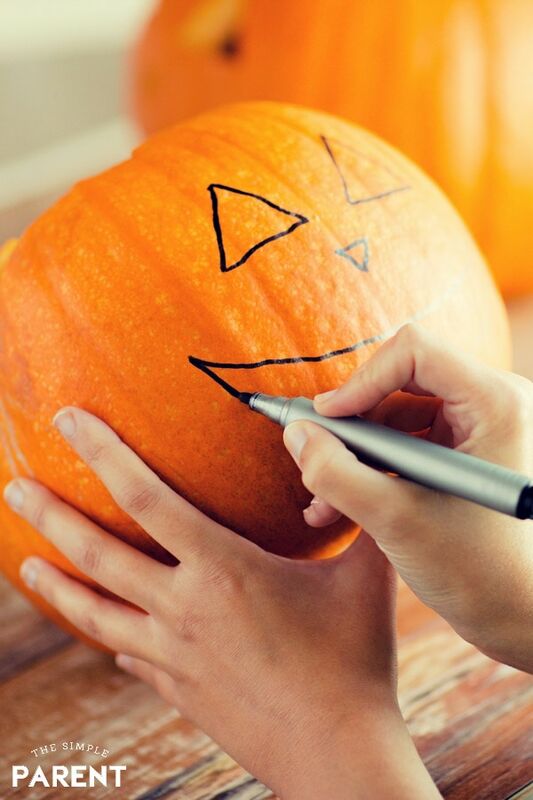 When it comes to Halloween party games for kids, a pumpkin decorating contest is a staple. Everyone can participate and everyone goes home with their pumpkin so it’s really like everyone wins! Small Pumpkins (no need to hollow out), Glue, Decorations such as washable paint and brushes, stickers, sequins, googly eyes, markers, etc. Let the kids start decorating!. Encourage creativity. Have a judging contest at the end. You can have small candy prizes for the winners or just a sticker even! They love having their pumpkins to keep! Print out the cards (there are ten different cards). Give one to each participant. Call out the Halloween pics until someone gets a BINGO. Different versions of charades are always fun Halloween games for kids. They’re easy to plan too which makes them a hit in our home! Place all the masks/accessories in the box. With their eyes closed, let the kids pick out an item. Then have them put them on and go around guessing what everyone is. Chaos and laughter will ensue! The great thing about this game is that you can usually get a ton of really affordable masks at Target or your local craft store! Set up the plastic jack-o-lanterns in a line. 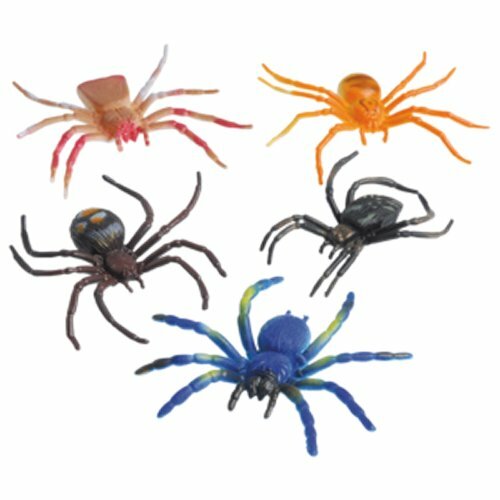 Have the kids stand about six feet away from them and try to toss a spider into each. Whoever gets the most in is the winner! 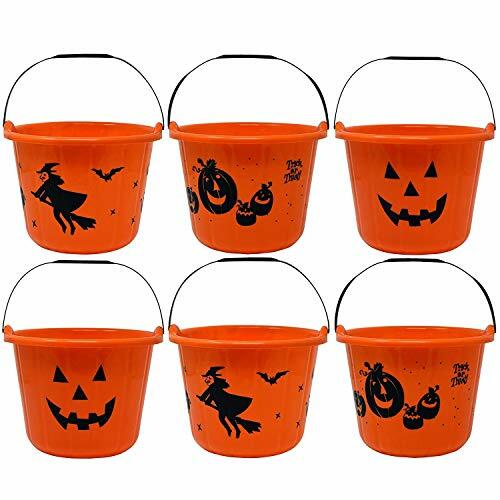 This is another one of the most flexible Halloween games for kids because you can use different sized pumpkin buckets and change the distance the kids stand from the buckets based on their age and ability level. 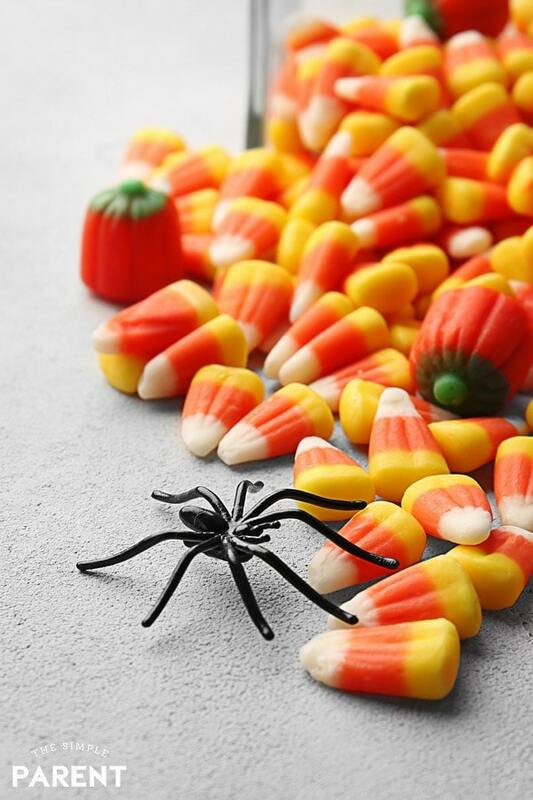 When it comes to kids Halloween party ideas we had to include this classic! I feel like you don’t see apple bobbing happening as often these days. I think that makes it even more fun because it’s often the first time the kids have done it! Simplicity is the key in this tried and true classic Halloween game. Just fill the tub with water, put in the apples and let the kids try to get an apple using only their mouth. They must keep their hands behind their back while bobbing. Keep the towels handy to dry them off because they will get wet! CLICK IMAGE TO DOWNLOAD YOUR FREE PRINTABLE! If you’re planning a get together this year, grab our printable packet of Halloween party games for kids so you have all of the supply lists and directions on hand! CLICK HERE TO DOWNLOAD YOUR COPY! 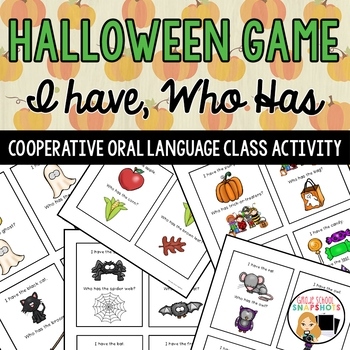 These games and activities are great for classroom parties, playdates, Mother’s Day out fun, and can even be used at fall festivals and other Halloween-themed celebrations you might be planning! Our kids love playing some of Halloween game ideas when we’re just hanging out at home too! Comment with your favorite Halloween game! We love new ideas! My favorite Halloween game is bobbing for apples. The only game I’ve ever played on Halloween is bobbing for apples. Otherwise the only thing we do is go trick or treating. Ghost in the raveyard is a great one. Bobbing for apples we love. We try to have a party most years. We love Halloween! Bobbing for apples is my favorite game for Halloween. I’ve only ever played bobbing for apples. My favorite game is bobbing for apples. I like Candy Corn Bingo. The kids stay interested in a long time with this game. My favorite Halloween game is bobbing for apples. Unhygienic but fun! My favorite Halloween game is trick or treating, lol. If that doesn’t count, I’ll pick bobbing for apples. Thanks for the giveaway! We always played “Red Light, Green Light” many, many years ago. It has always been bobbing for apples, lots of fun. We all enjoy Halloween bingo. We came across this last year. My favorite is the candy corn bingo! Kids of all ages can participate. My favorite is bobbing for apples. We like the mummy wrap. The kids and I love bobbing for apples! Its so much fun! Bobbling for apples is my favorite game. Love the ideas for Halloween. My daughter just bought a pumpkin too and cant wait to cut into it and create something fun. I liked Bobbing for Apples. My favorite game for Halloween is bobbing for apples. These would also be great games for any child who has a birthday party around Halloween. Bobbing for Apples was always my favorite. Bobbing for Apples is our favorite! When I was a kid we would play Ghost in the Graveyard. Which is basically hide and seek at night where we scared each other. Halloween bingo can be a fun with the littles ones that get overexcited at a win! 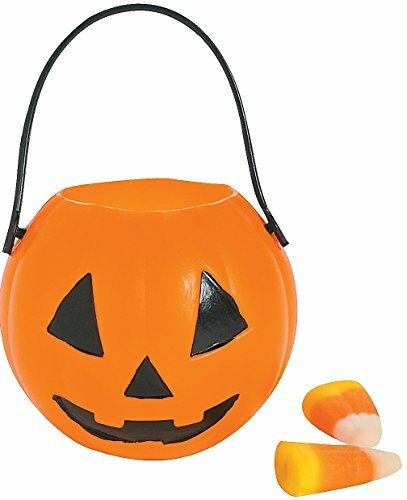 For younger kids the pumpkin ring toss and halloween bingo sounds fun. For my older teens we had a murder mystery party one Halloween that was really fun. You can order the mysteries online and then plan it out with your guests. Bobbing for apples is the only Halloween game I’m familiar with. I don’t know what the game is called, but I remember being blind folded and then having to touch things like cold spaghetti and jell-o. I think charades is probably my favorite game. 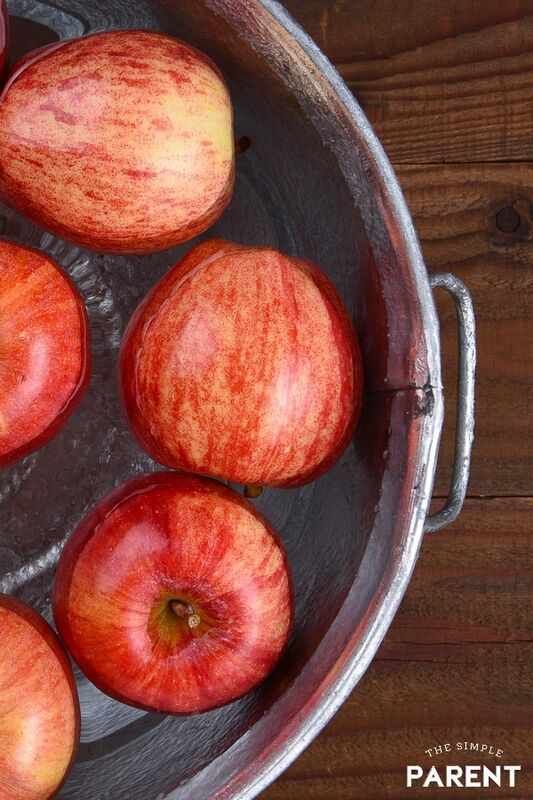 Bobbing for apples has always been a favorite…. to watch… not to participate in. But it’s a nice childhood memory! Bobbing for apples is my favorite but all of these games look like a lot of fun. The only Halloween game we have played over the past few years is Halloween bingo. My favorite Halloween game is Candy Corn Bingo. I have not played any Halloween games. I’ve been missing out! Our kids & their friends love our annual Halloween Party Scavenger Hunt !!! We love bobbing for apples. Fun game ! Bobbing for apples is always fun and it’s a classic! We love to bob for apples but we also usually have a family costume contest for extended family at our Halloween party. I still think that bobbing for apples is so fun. Ghost in the Graveyard is a good one! These are such fun ideas. Bobbing for apple s has always been a favorite. Thanks for the tips!